Last week I posted ‘A Full Confession’ but strictly speaking, didn’t. Which just goes to show, you can’t believe everything you read on the internet. I probably did come across a trifle sheepish in proportion to my mostly gift-related recent purchasings. This is because, even as I typed, I knew a limited edition screenprint of The Bus Driver’s Prayer, was snailmailing its way across the world. Although I am not in the slightest bit repentant, I now have nothing further to confess, which proves, Kate, that I am doing a better job of ‘good’ this week. 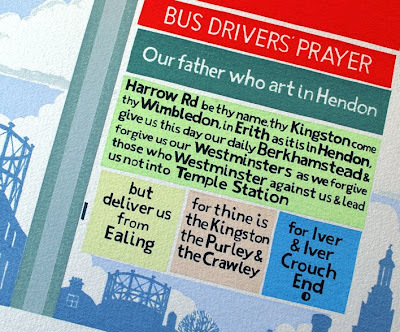 Martin Grover’s work is varied and gorgeous, but The Bus Driver’s Prayer, based on Ian Dury’s words, is so good for the soul, I’m sure the One Above would forgive the re-interpretation. 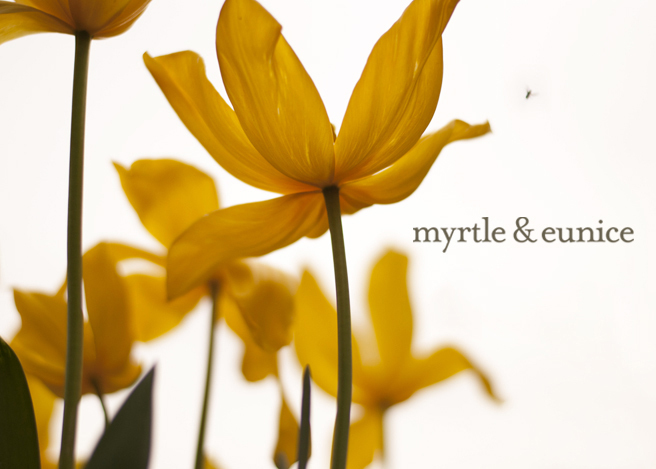 While Mr Myrtleandeunice is also fully signed up to this acquisition, he never stood a chance. Such was the onslaught of an articulate, relentless, PowerPoint-presented, one-sided negotiation for the use of his mostly-forgotten, English bank account and our few spare pennies rolling around inside. I always thought you were meant to have a Swiss bank account, but I see the distinct advantage of having that other currency on hand. No need to confess - post is completely different!? I've just spent quite a long time trying to find these prints online, are they still for sale? I think I really should have one too, they are so fantastic! ps I love your confessions..is there more? 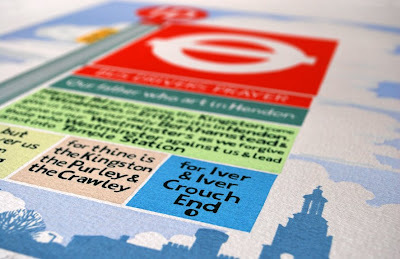 haha this is really cute - and i used to live in Ealing!